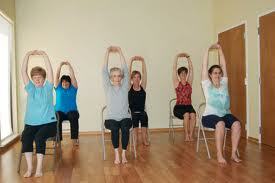 There have been lots of calls for Chair Yoga to return recently. So by popular demand, we’re putting it back on our schedule for May. If you struggle with getting up & down from the floor; if you’re recuperating from an illness or injury; if you struggle with balance or neuropathy—-Chair Yoga can be a great practice for you. We’ll practice seated or using the chair for support when we stand a bit. Registration is for a four week session of classes. To be continued if there is a demand.